Hot summer weather calls for lighter meals, and these salads make a perfectly light but filling main dish. Hot summer weather calls for lighter meals, and these salads make a perfectly light but filling main dish. And the best part? The preparation is both simple and quick. Last week I shared some of my favorite ways to use a rotisserie chicken. If you have any left over, toss it in my Black Bean and Mango Salad. I like to pack this salad for lunch. The combination of protein (in the quinoa) and fiber (lentils) make this a seriously satisfying meal. You can serve it alone or over a bed of greens. Cook lentils in 4 cups of simmering water for about 25 minutes, or until tender. Drain and set aside. While the lentils are cooking, cook the quinoa separately in 3.5 cups of water for 12 minutes. Fluff with a fork and then add to the cooked lentils. 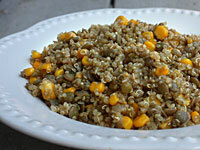 After the quinoa is done, rinse the pot and fill with a little more water and cook the corn briefly in it. This only takes about 5 minutes—you don’t want mushy corn. Add the corn to the mixture, and then toss with sesame oil, tamari, cayenne, salt, and pepper. Cool in the fridge before eating or, for more intense flavor, let it sit overnight. Some kids complain that they don’t like tofu, but I bet yours will change their tune once they try this delicious marinade. Heat up the grill. Drain the tofu and slice into 8 strips. Set aside on paper towels. Now, mix together the olive oil, maple syrup, cayenne, paprika, cumin, and sea salt. Brush it on both tofu strips AND veggies with a pastry brush (or just drizzle and smear with clean fingers). Sprinkle everything with a bit of sea salt. Grill tofu and veggies for about 10 minutes, or until the tofu has grill marks on it and the veggies are tender. Serve tofu and veggies on top of mixed lettuce and drizzle with dressing. Serve with fruit or French bread. This salad has a distinctively Southwestern taste. When I’m entertaining, I serve tortilla chips with homemade salsa and guacamole, too. Start by making the dressing. In a small bowl or blender combine olive oil, salt, mustard, and pepper. Either whisk or whirl until all ingredients are incorporated. Set aside. If you are cooking chicken, poach the breasts in simmering water until cooked through (about 15 minutes). Run cool water over the chicken, and then shred the meat into a bowl. If you’re using a rotisserie chicken, heat it in the microwave, then shred the meat. Peel the mangoes and cut into thin strips. Combine with black beans and thinly sliced fennel in another bowl. Top individual servings of spring mix lettuce with the black bean, mango, and fennel mixture. Top with chicken and drizzle with dressing. Read Jenna’s daily food and fitness blog, Eat, Live, Run.